You are expecting baby number 2! Congratulations! I know it is a fantastic feeling but with an older kid around, things can get a little difficult to manage. You might know a lot of things but might not have the time to see everything through. Having a handy list of things to do before the new baby arrives helps make the life a bit more easy. As this is the second time around, you might have a lot of things that can be reused. Check out all the things that can be reused, clean up and keep it ready for use and discard the things that cannot be used. Make a list of things that need to be brought new or sourced. Once you have a list ready, check if you can source a few things from friends and family. Clothes, pram, baby carrier etc. are things that are usually essential only for a small period of time but these are essential. If you can source a few things from friends it will help a lot in terms of managing finances. This is the next thing on the list. There are a lot of things to handle that need your presence or a bit of running around. Once baby number 2 arrives, this might not be easily achieved hence it is better to get done with the financial planning as early as possible. There will be hospital expenses, insurance, vaccinations etc. that need to be taken care of. Apart from this you might have some yearly investments that need to be worked out. Do budget for some sudden expenses and a short vacation. Usually second trimester is a good time to travel. You are out of the usual first trimester nausea and are still fit to travel. Enjoy this time with your family. Go on a short vacation and pamper yourself. Use this time to bond with your child one and husband. Once the baby number 2 arrives, you won’t enjoy a relaxed vacation for at least a couple of years. It is a good idea to inform child one in advance about the new arrival. The physical changes in mom will pose a few questions in the minds of baby number one. So the child will start with a few questions, use that cue to explain the child about the new arrival, how it will affect the time division of mom, what are your expectations from child one etc. Quell any fears they might have and also show them videos and tell them stories so that they start forming a bond with the baby before the baby arrives. If your older child is young, it is a good idea to take the child for his doctor’s appointment. Apart from vaccinations, a general health and dental check-up is recommended. Stock up on usual medications for common ailments. A painful tooth can cause misery to the household that is still managing night feeds of a new baby. The older child will be eager to help and instead of telling them they are too young to help, use this enthusiasm as a good time to bond and make a simple task list to enlist their help. Simple things like keeping diapers in their place, dropping dirty clothes in the laundry bag or opening door when it rings are things that an older child can do. ‘Me Time’ is something that we as moms and would be mom’s forget to plan for. A good spa time or reading a good novel, catching up with friends for coffee or even planning a movie night can all be your time to enjoy. This is a great time to unwind and relax before the next journey. Connect with your friends and enlist their support. With nuclear families it is not always possible that family will be close by. There will be days when you are nauseated, or when your hormones are acting up. Get your friends to be your saviors. Someone could probably take care of food, while someone could jump-in to handle child one for some time. Such small support will go a long way in a happy pregnancy. Pack a hospital bag not just for you and baby 2 but also for baby 1. While you will know from experience to pack things like mom’s change of clothes, diapers, pads, feeding bra and other essentials in the hospital bag for mom and baby, it is a good idea to pack for child 1 even if he is staying at home. Usually when you are away in the hospital, there will be some friend or family member who will stay back at home to assist child 1. In such scenario, they might not know where the child’s favourite toy is kept or which are the books they enjoy reading. Make a list of things that are essential as well as comforting. Label them and keep them in a bag. Tell the child about the bag, so that he can take his favourite things without depending on others. Make room for maternity clothes and pack away the things you will not be using immediately. Also stock up on clothes you will need for the next couple of months. Clothes like feeding bras, nursing gowns, feeding dresses etc. can be ordered online or can be stocked up beforehand. Usually there is a size fluctuation as finish your pregnancy term so keep that in mind if you are buying beforehand. The phrase that it takes a village to raise a kid is absolutely true. Don’t be ashamed in asking for help. Check if your mom or MIL can drop by and help you with chores. If your sister or SIL can entertain the older child for a few hours accept that help. See if your friend with kids from same school can help your older child with homework. All these are temporary arrangements and they will go a long way in managing both the kids. 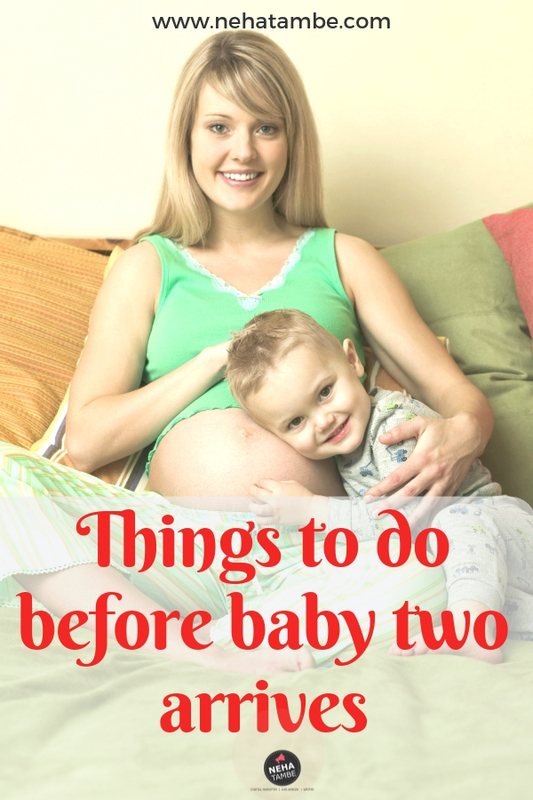 These are some of the tips that will help you in handling both the babies and your house in your pregnancy. With so much happening, if things don’t go as planned, learn to take a deep breath and let go. Things will happen, focus on the important things, the rest can take a back seat for some time. These are a few very practical tips you have shared Neha, which will help all the second time mothers to be organized and plan the things ahead of time. Quite important points that we need to know. Things like pram, rockers can be sourced easily from friends and they save lot of finances. Also, informing baby 1 is very important, so that the sense of insecurity doesn’t sets in. With a 2nd child on the way, not many Mom’s would have the time to think of all the practical and important pointers you’ve mentioned, Neha. Your post is a must read for anyone with a 2nd baby on the way. First time and second time. They are totally different experiences! So, it’s best for the second time moms to plan ahead and be organised. 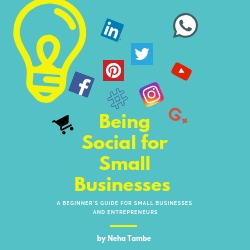 Great tips and pointers, Neha! This is such a sorted and exhaustive list buddy, it eases so much pressure on the second time mom.